“Here is a great perspective of a day in our life…yesterday we walked down to centro, where we both had the most amazing hour-long couples massage,” says David Smolyn, 51, who, along with partner Randy Hodgson, 58, splits his time between Puerto Vallarta in Mexico, and Toronto. 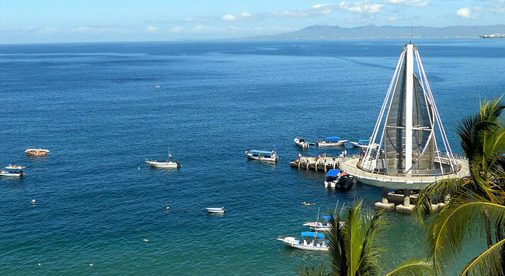 As a premier vacation destination, Puerto Vallarta offers plenty of things to do. Stroll down the mile-long malecón (seaside promenade) or through the narrow streets of Zona Romántica, with its white buildings with brick or vividly painted trim, and you have your pick of restaurants (from pub grub to sushi to gourmet), cafés, and shops. Music echoes in the streets, from mariachis to sultry jazz to rockin’ blues. The hills rise from the beach, which is golden sand and offers plenty of loungers shaded by umbrellas or palapas. The many hillside condos and homes have panoramic views of the ocean and throngs of happy beachgoers, as do the condos that line the beach. Parasailing is popular…or you could just relax in the shade with a good book and a frozen margarita. The beach and Bay of Banderas offer opportunities for boating, fishing, and lounging under a palapa. If golf is your game, there are 10 courses in and around PV, including four Jack Nicklaus-designed courses, with green fees starting at around $139. There are plenty of full- and part-timers to hang out with—it’s a close-knit expat community. That, many residents say, is the number one benefit. “In winter, you can have up to four to five things to do a night. The expat population at least triples,” says expat Mike Lyman, 69. Despite its popularity, Puerto Vallarta still has plenty of affordable real estate. The Zona Romántica, as well as Conchas Chinas and Amapas are the most desirable neighborhoods, as they’re in the heart of the dining and entertainment district and close to the beaches. A one-bedroom condo on the hill, with views over Old Town to the ocean is $130,000. In the up-and-coming neighborhood of 5 de Diciembre, is a two-bedroom condo with ocean views and community pool for $155,000. Rents start at about $500 a month for a one-bedroom apartment. Expat Rip Rupinski rents a one-bedroom apartment three blocks from the beach, in the heart of Puerto Vallarta’s Zona Romántica, for $800 a month. His monthly electric bill averages $19. His expenses fit nicely with his Social Security budget. Learning Spanish has also helped him feel comfortable getting out of the “gringo bubble” and eating at the cheaper, non-tourist restaurants. One of his favorite meals, is a shrimp quesadilla for 75 pesos ($4.20). He’s also fond of Langostinos, which has tables right in the sand. A typical retired couple, can expect to spend under $3,000 a month, all in. Longtime expats Tricia and Mike Lyman, religiously track their budget and stay at around $2,500, including plenty of day trips, dinners out, and live entertainment.